Every skilled cook needs at least one cast iron pan, but caring for a good one is a bit different than most other cookware. If not treated properly, it can be easy to ruin cast iron. While some tips are simple common sense, such as not running a cast iron pot or pan through a dishwasher, other tips are more counter-intuitive. However, with just a little effort and knowledge, anyone can end up with cast iron cookware that will last their entire lifetime. The first step in properly caring for a new cast iron pan, after thoroughly hand washing it with dish soap, is to season it. This involves rubbing a layer of vegetable oil or lard all over the front and back of the pan, and then baking the pan in an oven at a high temperature for an hour. This creates a natural non-stick layer, which both aids in cooking and protects the pan itself. After seasoning, wait for the pan to cool before removing from the oven and gently wiping it down with a paper towel. It’s also a good idea to place the pan in the oven upside down, so that a gunky layer of sticky oil doesn’t form in the base of the baking cookware. 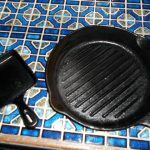 If properly maintained this seasoning can last a long time, but keep in mind that cast iron may need to be re-seasoned at some point. As summer arrives, many people prepare their grills for months of grilling their favorite foods. Hamburgers, pork, steak, chicken, kebabs, corn on the cob and so much more are just waiting to hit the grill and your table. It’s time to light up the grill and get started, but there’s an easier way to start a fire in your charcoal grill than using lighter fluid. Using a charcoal chimney starter is a simple, quick method of lighting your charcoal grill. Charcoal chimney starters are metal cylinders designed to light charcoal. They are incredibly simple devices that can even be made at home for little cost. All you need to use a charcoal chimney is the chimney, some charcoal, a few pages of newspaper, a lighter or match and, of course, the grill.